Hoang Yen Hotel is reliable address for you for when to stop the coastal city of Quy Nhon. With a magnificent position on An Duong Vuong avenue, the center of the coastal city ofQuy Nhon romantic, Hoang Yen Hotel 11 stories high on the premises of 5.000m2, East Sea to the east, south and north park Quy Nhon cool, the west An Duong Vuong avenue.Hoang Yen is one of the leading hotel, comfortable, modern in Quy Nhon. 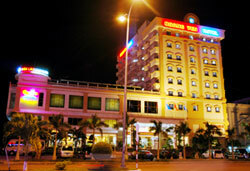 Located on the coast Qui Nhon lovely, clean, Hoang Yen Hotel international standard 3star, 93 bedroom complete with modern amenities, restaurants system serving more than2,000 guests, the hall conference for 400 luxury seats, a swimming pool, sun deck, tennis court, table tennis, fitness room, gymnasium, massage-sauna, karaoke, bars, discotheques, tourist services travel schedule and other commercial services. Specialgarden cafe Ricey is home to the ancient landmark dating back nearly 200 years old, this is the ideal relaxation for you. Hoang Yen hotel has spacious parking and safety for the user to facilitate the movement of vehicles; guards 24/24 to ensure absolute safety in all aspects. Coming to Hoang Yen Hotel, you will feel safe and satisfied by the modern facilities androom service attentive, caring, friendly professional staff will help you enjoy moment of their life dreams and hopes.